Barbara Sorenson, a tireless volunteer, advocate, and former president for Vecinos Unidos, a nonprofit after-school program in Herndon, retired in 2016 after serving children in the community for 15 years. 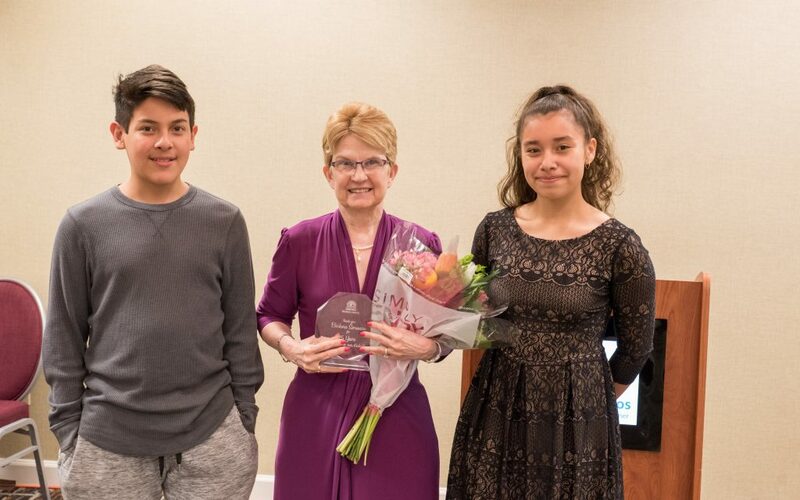 On April 19, Andrea Ciecierski, the current president; the board of directors; and 30 volunteers gathered to recognize her years of service during the program’s annual volunteer appreciation dinner at the Crowne Plaza in Herndon. Students Gaby Vidal Vasquez and Carlos Marroquin, each of whom attended the program for the full six years, presented her with flowers and an engraved crystal award on behalf of the board. Under Barbara’s leadership, the program flourished and grew to include 20 minutes of reading, math skills practice, and healthy snacks. Her devotion to the program was rewarded by the children’s success, and she loved finding former students around the community who were thriving. Vecinos Unidos was started in April 1997 to address the academic and social needs of Hispanic teens, but the program now assists all students who need homework assistance in grades 16. Under Sorenson’s leadership, the program evolved and thrived, serving more than 1,000 students in the Herndon school pyramid over the years. On any Monday to Thursday during the school year, VU’s rooms are bustling from 4:30–6:00 p.m. Students are grabbing a healthy snack and getting settled in. Volunteers are helping students with homework or practicing math skills with flashcards and other tools. In another room, students are choosing books to read aloud to an attentive volunteer. Once students have finished homework and reading and enrichment, they play educational games or use the Kindle Fire tablets that were recently donated to help students stay abreast of their peers. Since January, the students have been working enthusiastically to complete 120 hours of reading to earn an ice cream party—and they are closing in on that goal! Barbara Sorenson with long-time students honored for her 15 years of service to Vecinos Unidos. Plans for the two-week summer camp are underway and another session with the Herndon High School Robotics Club is scheduled. Volunteers and parents are the foundation of Vecinos Unidos. The all-volunteer board of directors and approximately 60 volunteers, who span all ages and occupations and include many high school students, donate thousands of hours a year. Parents are committed to their children’s learning, and Vecinos Unidos is eager to engage them as partners, hosting parent nights each semester. As a partner in Cornerstones’ Connections for Hope, Vecinos Unidos is also able to refer parents and students for services that are available to them through the Herndon Neighborhood Resource Center.